[Dora] Montefiore argued that because women had no representation, they could not make their positions known to members of Parliament; therefore, women lacked representation and had recourse only to passive resistance. 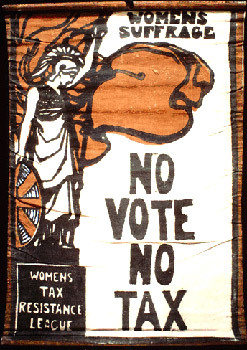 She had outlined a variation on this policy to readers of the feminist paper the Woman’s Signal in June 1897 , suggesting that should the third reading of the women’s enfranchisement bill then before the House of Commons fail, then those women “who believe in the justice of our demands should form a league, binding ourselves to resist passively the payment of taxes until such taxation be followed by representation.” She implemented this position in her own refusal to pay imperial taxes during the war. Montefiore was prosecuted for her wartime tax resistance in 1904 , and she went on to recommend the tactic in 1906 to a controversial new suffrage organization, the Women’s Social and Political Union, as a means of drawing attention to the campaign for women’s parliamentary enfranchisement. She implemented the protest again, to spectacular effect, during the “Siege of Montefiore,” at her Hammersmith, London, villa in May and June 1906 . The house, surrounded by a wall, could be reached only through an arched doorway, which Montefiore and her maid barred against the bailiffs. For six weeks, Montefiore resisted payment of her taxes, addressing the frequent crowds through the upper windows of the house. Montefiore’s success at mobilizing interest in the women’s cause, and her clear articulation of her protest as one aimed at remedying her exclusion from the parliamentary franchise, popularized the concept of resisting the government as a new approach to campaigning for women’s suffrage. For previous mentions of tax resistance in Britain’s women’s suffrage movement, see the Picket Line entries from 19 September 2004 , 14 December 2004 , and 13 February 2005 .